GDP doesn’t make us happy. Economics denies the enjoyment we get from stuff that is free: sunsets, conversation, going for a walk. – Home work. Cook yourself a toasted sandwich, you add nothing to GDP. Pay $11 at the cafe across the road, and you’ve just added to ‘progress’. –“If you dry your washing in the sun, it contributes nothing to the GDP figure, whereas if you dry it in a tumbler dryer, the figure goes up”. – Changes in quality. A 1985 computer added more to GDP than one from today. Meanwhile, a tsunami is about the best thing you can have. The loss of all those buildings, roads and lives doesn’t count against GDP, but paying doctors and nurses and construction contractors for the response and the rebuilding is a big fat boost to GDP. 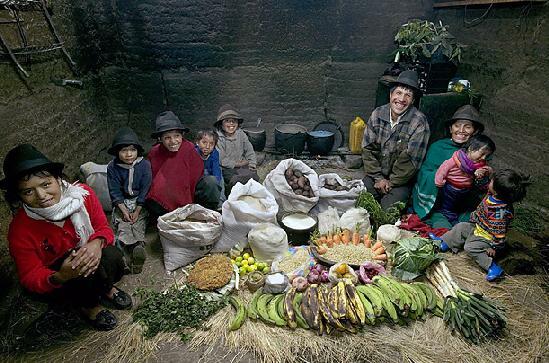 An Ecuadorian family at home, with a week’s food. This photo comes from a cool Time Magazine photo essay on what people eat around the world. The Ecuadorians aren’t even the poorest in the world. They get by on GDP of US $4,300 per person per year. (Australians scrape by on a comparatively flush $31,800, Malawians on $667) data. Low GDP can manifest in suffering, Malawi. A lot of people look at global inequality as a static situation. If the west has much, then Africa has little. Wrong. Both can be rich, and we need a dynamic explanation, not a static one. The west is rich because of economic growth. 100 years of four percent growth will turn a dollar a day into 48 dollars a day. China’s reforms have created unprecedented economic growth that lifted 500 million people above the dollar-a-day poverty line within a generation. This trumps anything charity could achieve. Can we reconcile the importance of GDP growth in poverty reduction with its apparent irrelevance in the developed world? Is there a point in development where extra consumption becomes less important? We might think so, but I suspect it is probably when someone has about two-thirds what you have. The same argument will probably apply across time. 1970s liberal thinkers probably thought that a per capita gdp of $3,000 (2/3s of the then US GDP of $4,500) represented a sufficient quality of life. Now we probably think it’s $30,000, or 2/3s of the current US GDP of 45k. Problem is, GDP growth brings a lot of stuff we don’t like, like Hummers, McMansions and plasma tvs, and a whole lot of stuff we do like, like antibiotics, solar panels, apple iphones, plasma tvs, fairtrade shade-grown arabica, and the mother-flipping blogosphere. Every so often, the dross includes something we reckon we can’t do without. So the standard of development we think is appropriate will be relative. There’s always going to be a push to catch up the laggards with the leaders. Makes sense, no problems, we can understand it, why are we still talking about this? – Franny Armstrong, coordinator of the UK’s 10:10 campaign. So, if we catch the poor of the world up to our standard of living, the global environment will likely be destroyed by the main downsides of our modern way of life – carbon pollution, particle emissions, toxic contamination of the ocean, habitat destruction and consumer garbage. The current best guess is that we would need five earth-like planets to comfortably support 6 billion American lifestyles. Does this leave people who want to rectify poverty in a bind? I’ve got cognitive dissonance. Your thoughts? Also, in the next paragraph you list ‘plasma tvs’ as something that ‘we’ don’t and do like. This article is a bit all over the place. It starts of about the relationship between happiness and GDP, but then morphs into to one about the environment and making value judgements about consumption. You should then place your argument within this discussion. Thanks for sharing those links- they look great! I’ve fixed the typo you spotted.